When one studies a map of the Cape Peninsula there are two areas which show up as lowlands on the map. The one area is the Cape Flats which extends all the way from Table bay in the north to False Bay in the south. A second area which is not as large is the Fish Hoek valley which extends from False bay in the east to the Atlantic ocean in the west. These two areas were once covered by sea and evidence of this can be found by looking at the sand found in the Cape Flats and the Fish Hoek Valley. The northern rim of the Fish Hoek valley is also lined with sand dunes adding to the evidence that the valley was once covered by water. It is on this sand dune that some interesting discoveries were made in the early 1900's. Victor Peers a resident of Fish Hoek who was an avid collector of succulents and bulbous plants was walking along the top of the sand dune ridge when he passed by what was known as Schildergat cave near the top of the ridge. On entering the cave he found some rock splinters which looked like ancient implements used by early inhabitants of the Cape. He took them home with him and showed them to a friend who at the time was the only trained South African Archaeologist in Cape Town and was employed by the Cape Town University. John Goodwin confirmed that the rocks were stone age implements and decided to do an archaeological dig at the site. As there were no other archaeologists in the Cape at the time and he was too busy setting up the archaelogical department for the university he asked Victor Peers whether he would like to do the dig seeing as he had discovered the implements. Peers agreed and he and his son Bertie were quickly trained in the techniques to be used in an archaelogical dig. 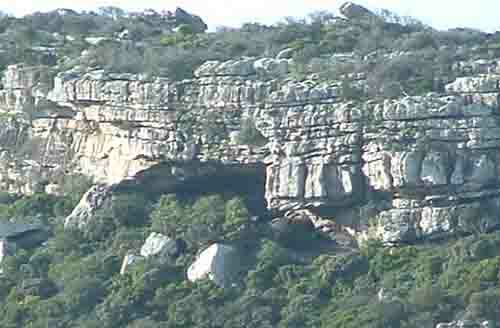 To round off their training they were sent on a training dig into the Kalk Bay caves before being let loose on the Schildergat Cave. Over the next two years Peers and his son worked in the cave and made some very interesting discoveries. The first thing they discovered was a shell midden which was up to one and a half metres thick and said to be several thousand years old. Middens are ancient rubbish dumps and indicate the presence of ancient man in the area. Digging into the midden layer Peers unearthed six bodies, those of two women and four children. With them he found ostrich egg beads, shell pendants and a piece of iron said to be part of an old arrow head. The remains of small leather bags containing what appeared to be medicine were also discovered. Digging deeper two more people were found and then a skeleton of a man of about thirty was unearthed. It was this skeleton that attracted the attentions of the press and the international anthropologists. The skull was sent to England and was examined by Sir Arthur Keith who described it as the largest brained type of humanity so far discovered in South Africa. The skull became known as the Fish Hoek Man and was at first dated as being 15000 years old although later investigations amended its age to 12000 years of age. Unfortunately all the publicity of the discovery of the skeletons brought out amateur archaeologists who visited the caves and tried their hands at archaelogical digging. Experts have no doubts that many more stone implements and other interesting artifacts were found by them and carried off. In 1941 H S Jager the first mayor of Fish Hoek who was also an avid amateur archaeologist decided to honour Peers for the work carried out on the cave by naming it Peers Cave after him. It was also suggested that the cave be declared a National Monument but due to wranglings between the various parties who had an interest in the cave this never happened. Sadly an important part of the Capes' archaelogical history that could have been preserved for future generations has been left to the ravages of the weather and vandals who deface its walls with graffiti. For those who are interested the cave can still be visited after quite a strenuous climb up the sand dunes that guard the route to the cave.